This choice has proven to be a good one, and I was touched when MAS (many thanks to the help of a family friend, Sook Yee, who put us in touch) upgraded my parents and I from Economy to Business Class. They had upgraded us for our first trip to the UK in 2014 when I started university, and an upgrade now at the end of my undergraduate degree was the perfect sweet ending. 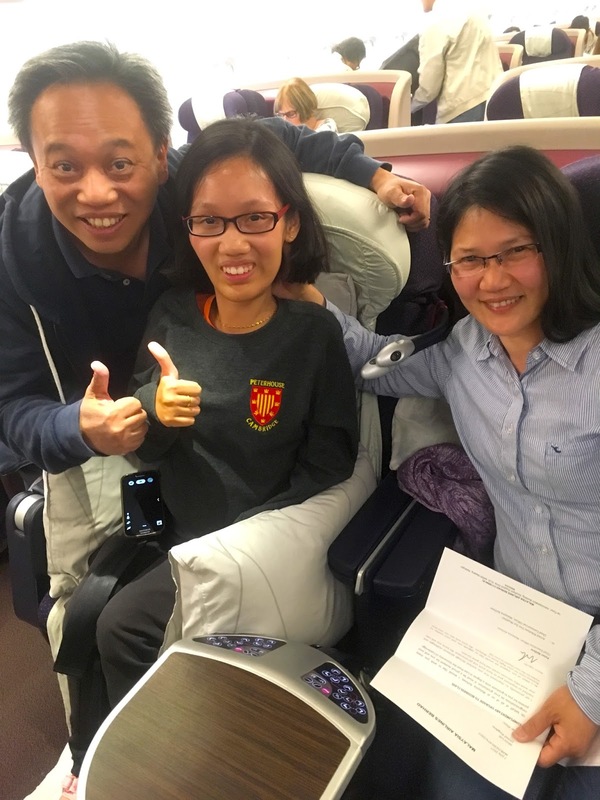 From check-in to check-out, we were well taken care of, and the flight was very comfortable, which was particularly important to me due to my medical condition. Aside from the flight itself, I was quite concerned about my wheelchairs - I brought back two this time - due to previous experiences, and I'm sure all wheelchair-users will understand my concern. However, I'm glad to say that MAS took great care of them, and both arrived in the same condition I left them in. 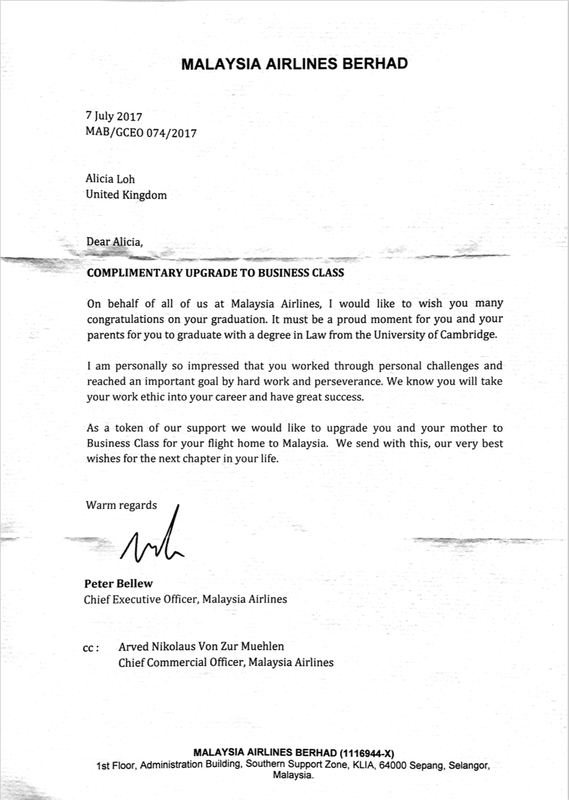 Perhaps what touched me most, however, was a letter from MAS CEO Peter Bellew congratulating me on having graduated. Beyond a much-appreciated personal touch, it also showed me that the MAS management prioritises passengers and is genuinely working to provide us with a good experience. We met several lovely people along the way, and I would like to say a special thanks in particular to: Suzy, who took care of us from the moment we checked-in to when we boarded the plane in Heathrow, Yeoh and his wonderful team onboard the flight, and the lovely Maria, who ensured a smooth conclusion to our journey when we arrived in KLIA. I would also like to thank Sook Yee and Mr Thariq for making this possible. MAS's generosity and extra care is why my parents and I continue to use the airline. Throughout this journey, they took excellent care of us, and we were very impressed by their wonderful service. They truly exhibited the Malaysian Hospitality that they proudly declare, and went beyond. Just as Mr Bellew sent his best wishes for the next chapter of my life, I wish MAS well in its endeavours and as it continues to provide the best service to its passengers. PS. I will write about graduation and my time in Cambridge over the next few weeks, so stay tuned!